You may not think of a child dealing with arthritis — that’s typically something we associate with what Grandma used to call her “old bones.” But the reality is that 300,000 children in the United States, under the age of 16, deal with some sort of autoimmune or inflammatory condition that causes stiff, swollen, aching joints. As parents, there are often situations with our children when we want nothing more than to ease their pain, but are helpless to do so. This, however, does not have to be one of those times. In addition to the help that medical interventions can give, you can provide your child with relief right at home. For years warm water hydrotherapy through the use of a hot tub has shown to reduce joint inflammation, increase mobility and provide relief from aching and sore muscles. And with a swim spa for juvenile arthritis, you can add water exercise to our at-home treatment. The buoyancy of the water helps to reduce strain on joints while helping to build muscle and resistance, helping your child’s body get through the day a bit easier. It can also be a wonderful way to connect as a family. It doesn’t have to always be about just health and wellness — it can be about spending time together and enjoying each other’s company, too. Make it a time that you and your child can touch base about their day. That hot tub may just be the catalyst to some of the best conversations you and your child will have. 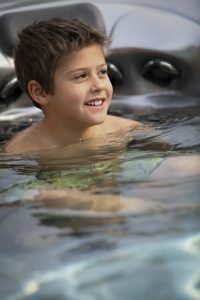 As you explore your options for hot tub therapy for your child dealing with juvenile arthritis, consider South East Spas. We’re happy to help you find a hot tub that fits the needs for your entire family’s health, well-being and connection.